The Best Health Law blogs from thousands of top Health blogs in our index using search and social metrics. Data will be refreshed once a week. Boston, MA About Blog Health Law & Policy Matters distills the issues for our busy readers as well as shares creative ideas about improving the nation’s health care system. Facebook fans 553. Twitter followers 3,412. About Blog Shaping the World of Healthcare Law. We want our clients to feel that we are as invested in their matters as much as they are. Facebook fans 751. Twitter followers 2,892. Facebook fans 1,255. Twitter followers 173. About Blog Examining the intersection of law and health care, biotech & bioethics. Facebook fans 121,346. Twitter followers n/a. Australia About Blog Stay updated with the latest news and journal articles on health law and ethics. Facebook fans 184. Twitter followers 1,139. USA About Blog As the nation’s largest law firm focused exclusively on health care organizations, Hall Render’s knowledge and experience set us apart. Facebook fans 92. Twitter followers 911. Washington, D.C. to California About Blog This law blog provides news & commentary on developments in health law. Topics include insurance exchanges and marketplaces, the affordable care act and HIPAA. New York, NY About Blog Biologics Blog is a source of insights, information and analysis related to biologics, including the legal developments, trends and changing regulation that impact the biotechnology industry. Patterson Belknap represents biotechnology, pharmaceutical and healthcare companies in a broad range of patent litigation matters, including patent infringement cases, PTO trial proceedings, patent licensing. Facebook fans 187. Twitter followers 97. About Blog Analysis & commentary by Reed Smith on trends & developments in life sciences & health care law.Life Sciences Legal Update is written by the Reed Smith Life Sciences Health Industry attorneys and offers updates on health care matters. Facebook fans 994. Twitter followers 15,246. Los Angeles, CA About Blog The law firm for Healthcare Providers. Nelson Hardiman attorneys represent healthcare providers in all legal matters. Facebook fans 636. Twitter followers 4,833. Michigan About Blog This blog will primarily focus on topics that are of interest to health care practitioners, providers and others working in the health care realm. Facebook fans 531. Twitter followers 596. Georgetown Law, Washington, DC About Blog Premier research center for global health law, domestic health policy, and scholarship. Facebook fans 1,680. Twitter followers 1,505. About Blog This publication offers insight and commentary regarding the defense of pharmaceutical and medical device product liability litigation. London About Blog Nursing ethics and law - news, analysis and nursing practice. The most-visited nursing website in Europe and leading source of nursing news. Includes CPD, clinical research and innovation to support nurses’ careers. Facebook fans 68,817. Twitter followers 105,582. About Blog A discussion of legal issues affecting physicians & non-institutional providers.Physician Law is written by Health Law Team at Fox Rothschild & covers legal updates on Medical Practice law. Facebook fans 1,169. Twitter followers n/a. United States About Blog Monitoring Legal Developments Relating to the Privacy and Security of Health Information. Facebook fans 1,169. Twitter followers 4,418. About Blog Our Health Care Practice Group plans to use this blog to provide updates and insights on the latest developments in the health care industry. Facebook fans n/a. Twitter followers 1,716. London About Blog Find out more about medical negligence and personal injury services. Facebook fans n/a. Twitter followers 3,533. About Blog Advising Health and Wellness Ventures. Healthcare and corporate attorney helping entrepreneurs accelerate in a transformational era. Cambridge MA About Blog The Center for Health Law and Policy Innovation (CHLPI) is a clinical teaching program of Harvard Law School, addressing health disparities with legal solutions. United States About Blog Comprehensive healthcare law services. Facebook fans 156. Twitter followers 689. Hub of the Universe Boston MA About Blog Current developments in health care law and policy together with the observations and analysis of David Harlow, principal of The Harlow Group LLC, a health care law and consulting firm based near Boston, Massachusetts. Facebook fans 1,066. Twitter followers 16,706. Northern Virginia About Blog Osha Law Blog provides important insight and commentary on workplace safety and health issues, including safety audits, policy review, and training, for employers. Facebook fans 1,193. Twitter followers 142. About Blog A Health Care Reform Blog––Bob Laszewski's review of the latest developments in federal health policy, health care reform, and marketplace activities in the health care financing business. Indianapolis, IN About Blog This Medical Malpractice blog offers news and other information Garau Germano, P.C. hopes Indianapolis, Indiana residents will find helpful. Facebook fans 25. Twitter followers 3. About Blog Professional licensing matters and related regulatory issues for health care professionals. About Blog Phoenix, Arizona Medical Malpractice Law Firm. Orlando, FL About Blog Through this blog we hope to share happenings in the area of health law, along with our knowledge of this field. Facebook fans 585. Twitter followers 2,080. About Blog Our Bergen County, New Jersey blog deals with Medical Malpractice and related issues. About Blog New York Health Law is published by the Farrell Fritz Healthcare practice group and covers issues around health law in New York State. Westchester, New York About Blog Gallivan & Gallivan provides aggressive legal representation in New York personal injury and nursing home neglect cases. Over 40 years of experience practicing personal injury law, criminal defense, and medical malpractice/nursing home law. Facebook fans 69. Twitter followers 172. Florida, USA About Blog The Florida Healthcare Law Firm's team of attorneys is one of South Florida's leading providers of legal services for healthcare providers and businesses. About Blog New Jersey Health Care Blog is your news source for all healthcare news, laws, and reglations, authored by Giordano, Halleran & Ciesla attorneys Frank Ciesla, Beth Christian,Sharlene Hunt and Ari Burd. Sydney, New South Wales About Blog A blog on health governance, law, and ethics, by health law experts at Sydney Law School. Toronto About Blog With our focus on health care law in Toronto, Ontario, our lawyers are able to understand your unique challenges and concerns. Facebook fans 92. Twitter followers 1,117. About Blog Healthcare Legal Issues. Toronto, ON About Blog Kate explains the ever-changing and highly-regulated world of health care so that you feel empowered in your role. She provides timely legal advice, creates practical reference materials for you to use, and delivers powerful training sessions so you and your team understand the law and keep moving forward. About Blog Articles related to legal matters on healthcare and pharmacy. Raleigh, NC About Blog A NC Medicaid Legal Blog for health care providers, Medicaid recipients, and politically-interested persons by Knicole C. Emanuel, attorney at Gordon & Rees in Raleigh, NC. About Blog Nursing home information and litigation. About Blog Representing health care professionals and providers exclusively for all legal needs. Facebook fans 579. Twitter followers 2,081. About Blog Leading insight on legal developments in the healthcare industry. Stay up-to-date on healthcare enforcement and regulations with the Health Law Pulse. Facebook fans n/a. Twitter followers 14,020. About Blog The Health Law Sidebar will provide you with the latest regulatory and statutory updates from the industry, and will also highlight news items of interest across the healthcare field. About Blog Your legal resource for health care law. Orlando, FL About Blog At The Health Law Firm, we concentrate in representing healthcare providers, exclusively. Our health law attorneys and paralegals have decades of experience in the legal and health care fields. Austin, Texas About Blog We have extensive knowledge about the healthcare industry and the laws and regulations that govern it; our practice is focused on helping our clients meet the legal challenges of working for or with the health care industry. Facebook fans 55. Twitter followers 145. Pittsburgh, PA About Blog Med Law Blog(R) by Tucker Arensberg, PC, a Pennsylvania law firm with a health care law practice. Farmington Hills, MI; New York, NY About Blog The Health Law Partners, P.C. ("HLP") was founded by a team of attorneys, each of whom practices exclusively in the area of health care law, for the purpose of providing solutions to health care providers' and organizations' legal, business and reimbursement challenges. Facebook fans 65. Twitter followers 112. About Blog This blog was created and run in conjunction with the Windsor Health Law Club. Here, you will find blog pieces on new, exciting, interesting, or unique topics in health law, or any combination of the above. Florida, USA About Blog We handle car accident, wrongful death claims, truck accident & other injury victims in West Palm Beach, Plantation, Miami, Port St. Lucie, & Orlando. Facebook fans 1,339. Twitter followers 439. About Blog Fenton Law Group is one of the nation’s leading healthcare law firms. From complex litigation and compliance to license defense and transactions, Fenton Law Group builds on the Fenton brand to help healthcare industry companies and individuals develop preventative and proactive legal strategies. About Blog The blog for Psychologists, Mental Health Counselors, Clinical Social Workers, Marital and Family Therapists, Residents and Interns. About Blog Regular UK healthcare law updates by the Serjeants' Inn Chambers' Clinical Negligence and Healthcare team. Facebook fans n/a. Twitter followers 1,921. About Blog Recognised as a market leader in medical negligence, we provide innovative and pragmatic solutions to liability claims, disputes of all types and health law issues generally. About Blog Regular UK healthcare law updates by the Serjeants' Inn Chambers' Clinical Negligence and Healthcare team. Updating medical treatment: Decission and the law. About Blog Health Law Update blog is presented by members of BakerHostetler's Healthcare Industry team offering industry-related news and developments. Facebook fans 63. Twitter followers 125. About Blog Triage is written by the Squire Patton Boggs Health Care team and provides insights on Healthcare reform updates & law. Facebook fans 2,171. Twitter followers 10,685. About Blog Covering emerging and new developments in health law, health care reform, privacy issues, and regulatory and compliance matters. About Blog Faegre Baker Daniels’ blog provides the latest breaking news on health care reform to businesses, whether providers or employers - following the issues closely to provide readers with the most up-to-date information. United States About Blog Akerman Insights on the Latest Developments in Healthcare Law. Akerman's Health Law Rx blog provides timely updates on the latest health law issues to keep our clients, friends, and readers up to date on pertinent legal developments. About Blog Articles related to health law matters.Frost Brown Todd is a full-service law firm serving some of America’s top corporations and emerging companies. Facebook fans 203. Twitter followers 1,523. About Blog Our skilled health law lawyers provide efficient, professional and cost-effective results. We have comprehensive experience representing professionals with their health law and related concerns.We advocate on behalf of all. About Blog This Medical Malpractice blog by Tooher Wocl & Leydon, LLC offers information and commentary for residents of Stamford, Connecticut. Phoenix, Arizona About Blog This Medical Malpractice blog by Law Offices of Raymond J. Slomski, P.C. discusses significant legal issues for residents of Phoenix, Arizona. Facebook fans 44. Twitter followers 120. Long Beach, California About Blog The Legal Source for the Practice of Medicine in California. A blog serving as a legal source for the practice of medicine in California. Facebook fans 402. Twitter followers 160. CONGRATULATIONS to every blogger that has made this Top Health Law Blogs list! 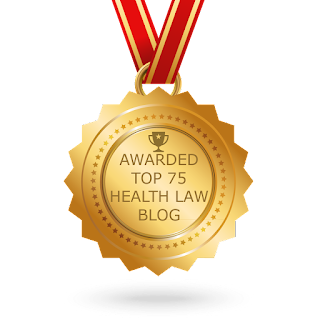 This is the most comprehensive list of best Health Law blogs on the internet and I’m honoured to have you as part of this! I personally give you a high-five and want to thank you for your contribution to this world.